The Pro Shop at Sunshine Lanes is your one stop shop for all of your bowling needs. Our Pro Shop staff has 50+ combined years of bowling experience. This means that from open play bowlers to competitive league and tournament bowlers, we have what you need to take your game to the next level. Our staff can help you increase your average, or just help you keep your ball out of the gutter! Come by and check out our merchandise, chat it up with one of our experienced Pro Shop Staff, or book a lesson! Kyndall has worked for Enterprise Park Lanes for the past six years, although he's been bowling for his entire life. He's also worked the Front Desk, in the back, he's oiled the lanes, and worked as Pro Shop Assistant Manager before taking on his current role. Kyndall's favorite party of his job is giving bowling lessons, and he's got quite the record to do so. He bowled his first 300 game at age 15. Since then, he's bowled a total of 8 300 games and 4 800 series. Outside of work, Kyndall enjoys golf (yes, he's made a hole in one! ), competitive bowling, Arkansas football, and playing with his dogs. Jake has been with Enterprise Park Lanes for a couple years, and he's been bowling for 13. Before joining us in the Pro Shop, Jake worked at the Front Desk and oiled lanes during the Greater Ozarks Open. He's got an impressive bowling record! He took first place in the 2016 GSM USBS Youth Championship, first place in the 2016 High School Bowling Conference, and was the 2015 USBC Pepsi High School State Runner Up. Jake's favorite part of his job is the simple fact that anyone can learn to bowl. He enjoys teaching and encouraging the sport. Outside of work, Jake can often be found woodworking, or playing guitar. Keven has only been with Enterprise Park Lanes for a short period of time, but he's worked in the bowling industry for a total of five years. Beyond that, he's bowled personally for 18! We are glad to have him join our staff. Keven has won 20+ bowling tournaments around the United States. He's gotten 32 300 games and 12 800 series. Keven has an impressive bowling record, which equips him to take part in coaching and helping our youth improve their game. It's his favorite part of his job! Outside of work, Keven enjoys writing music, playing basketball, and playing baseball. Enjoy a custom, personalized, one-on-one lesson with our bronze certifed USBC coach, and Pro-Shop Manager, Kyndall Martin! 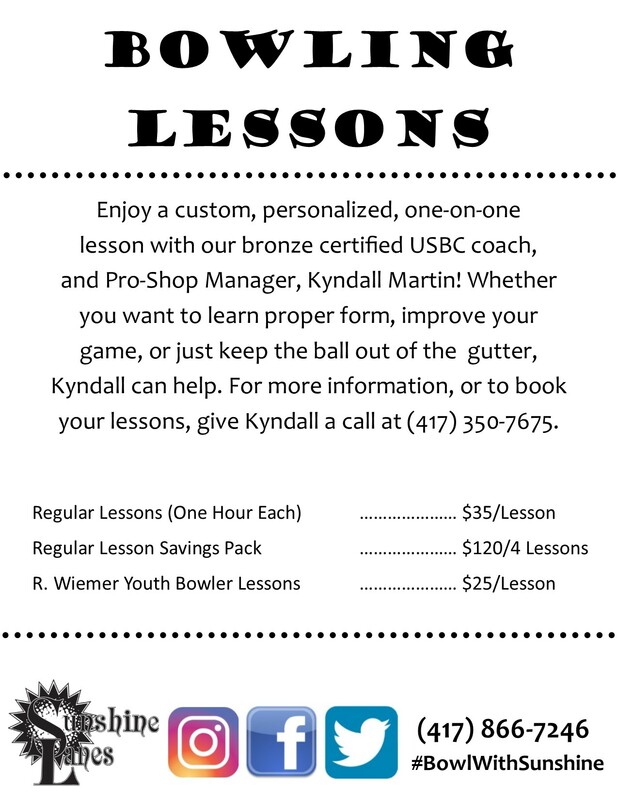 Wheather you want to learn proper form, improve your game or just keep the ball out of the gutter, Kyndall can help. For more information, or to book your lessons, give Kyndall a call at (417)350-7675.